This month's installment of "On Guitar' will concern the Roland GR-700 guitar synthesizer unit. Last month we reviewed the GR-707 guitar, and since that is used to control the GR-700, its function as a controller will also be part of this month's review. 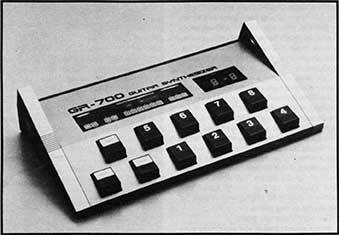 The GR-700 unit is the actual synthesizer section of the 700 series. Essentially it's a six- voice, polyphonic, programmable synthesizer - in fact, it's basically a Roland JX-3P. It has 12 DCOs (digital controlled oscillators), six VCFs, six VCAs and six envelopes, with two DCOs and one each of the other parameters for each string. The unit contains 64 factory programs, plus a memory cartridge for storing your own data. This is an excellent innovation in that unlike cassette tape storage, the transfer of information is instantaneous, so you can actually dump in new programs on stage. Cassette tape storage takes several seconds at best to complete its data transfer, making it bothersome and almost impractical live. One of the most exciting aspects of the GR-700 is that it's MIDI interfaceable, meaning that for the first time, guitar players can control - with a guitar - sequencers, other synthesizers and even drum machines! If you refer to the photo of the GR-700, I'll give you a rundown of the front panel controls: The first thing you'll notice is the two rows of foot pedals. The first row contains the hold pedal, the bank pedal and pedals numbered I -4. The second row contains the edit pedal and pedals numbered 5-8. The top panel contains an array of touch switches that control various functions such as memory write and storage, string dynamics and selection, and chorus and chromatic functions. Next to the touch switches is a large LED readout. Since the GR-700 was designed as a floor unit, this giant LED display is invaluable, especially in a live situation; you always know the status of the synthesizer no matter what the lighting conditions on stage. To finish off the general description, the back panel contains the memory cartridge slot, a tuning knob, a connector for the optional PG-200 programmer, the MIDI-out connector, a memory protect switch, a pitch control jack (using a volume-type pedal), two (stereo) balanced XLR connectors, an output-level switch, two (stereo) unbalanced phone jacks, a guitar-only output jack, a VCF control jack (again a volume-type pedal) and, of course, the ac power cord and switch. Simply plug in and lock the 24-pin cable into the GR-707, then into the GR-700. Then plug two guitar cords into the unbalanced stereo output jacks and finally into a stereo power amp and stereo speakers. Turn it on and you're ready for all kinds of fun! synthesizer with 12 DCOs, six VCFs, six VCAs and six envelopes. The first thing you'll see in the LED display s "I-I ," which stands for bank l, patch l. And that happens to be one of the finest, most authentic string sounds you've ever heard; play a regular G chord and out come angels from heaven. I spent the better part of an afternoon and evening going through each patch. There are two different but equally incredible Hammond B-3-type organ sounds, and even a most convincing pipe organ sound that makes you feel as if you're playing a Bach fugue at St. Paul's Cathedral! What's also great is that the guitar has a separate output all its own, which I sent to a Rockman and then into my mixer. It was sheer bliss being able to do all these great synthesizer licks on a guitar and still have a guitar sound too. It's a remarkable feeling to strum a guitar and hear a guitar plus steel drums, for instance. The one criticism to make about the GR-700 is its owner's manual, which needs improvement. Now, we've all had problems with Japanese equipment manuals that have obviously been translated from Japanese. But in this case, it's not just the grammar, there are certain concepts that need to be phrased better in order to clarify the more complicated procedures. Next month we'll conclude our review of the Roland GR-707 system guitar synthesizer with final impressions regarding programming ease, tracking, etc., and I'll include a list of options, some special Roland consumer information, and various other thoughts and opinions. until then, remember: Keep makin' music! 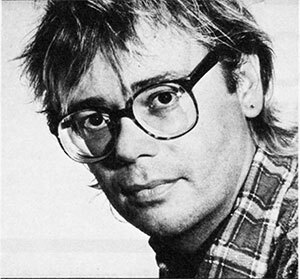 Steve Hunter has recorded and toured with many of contemporary music's biggest names, including Alice Cooper, Peter Gabriel, Lou Reed and Mitch Ryder's Detroit. He is presently involved in several film scoring and studio projects. Download the original article (pdf).